Bryan Fuller recently took some time out from his busy schedule—filled as it is with mercilessly taunting Hannibal fans about all the wonderfully gruesome things they’ll never get to see—to drop some hints about the other cult genre show he’s currently got in the works: Starz’s adaptation of Neil Gaiman’s novel American Gods. 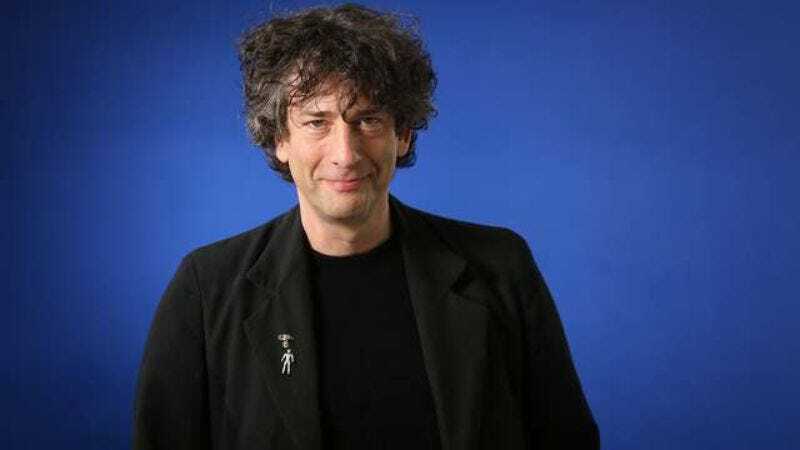 And while there’s still no casting information for the book’s taciturn felon Shadow or mythological con man Mr. Wednesday, Fuller did reveal that a talented-if-inexperienced screenwriter has signed on to help pen some of the show’s scripts: author Neil Gaiman. Gaiman isn’t a total neophyte to TV writing; he co-wrote all six episodes (and the companion novelization) of Neverwhere for BBC2 back in the ’90s, and he’s conjured up a couple of scripts—including the classic boy-meets-time-travelling-phone-booth story “The Doctor’s Wife”—for the rebooted Doctor Who. Plus, unlike, say, George R.R. Martin—who had to beg off of writing episodes for recent seasons of Game Of Thrones—Gaiman doesn’t have to live with the psychic pressure emitted by millions of people trying to mentally compel him to stop screwing around with making TV shows, so that he can finally sit down and finish his goddamned books.